or Small Office looking for Virtual Office.The prices for an office on rent in Noida are extremely high. It is only advisable to say goodbye to the old way of renting gigantic rooms, and start with a virtual office on rent in Noida. 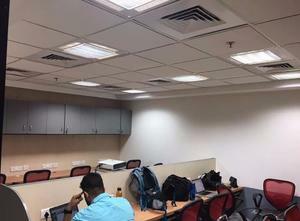 Available now is a Noida Coworking or Office Space in noida for Rent in Noida at Affordable Prices. Conference Rooms and well made wooden workstations. 8.Overdose of tea and coffee. The best part about Workbar is that apart from the usual stuff that a coworking space provides, it has Startup Boosters which will give your business ample and valuable networking opportunities. One can gain access to business insights, events and their handpicked key partner alliances will help you and your business grow. You just need to contact us.